A new day, a new lesson. I met Scooter and Riley while visiting a client for a commission painting of a home in Vero Beach, Florida. These characters were too cute not to paint! 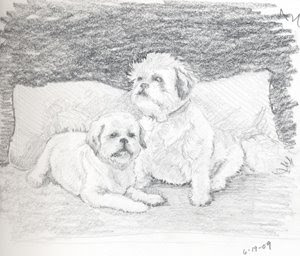 Here is the drawing I developed from several photos I took of Scooter and Riley. I drew this in my spiral bound sketchbook. To develop the painting, I scanned the drawing into my computer and printed out tiled pages enlarged to the size I wanted for this piece, which will be a half sheet of watercolor paper, about 14 by 22 inches. As I worked on the drawing I thought about how I might develop the values, shadows and details of the piece in watercolor. The drawing process is so valuable. I hope that all watercolor enthusiasts will take a drawing class to develop their skill. It is important to do the drawing and preliminary work before you paint. Somehow this preliminary work gets information into your brain and helps you to solve problems before you ever touch your watercolors!